Medulloblastoma is a highly cellular malignant embryonal neoplasm of the cerebellum that is more common in children than adults. The incidence in adults is approximately 0.6–1 cases per million. Patients with medulloblastoma demonstrate a combination of signs and symptoms caused by increased intracranial pressure and cerebellar dysfunction that evolve over a period of weeks to a few months. Standard staging procedures include diagnostic imaging with MRI of the brain and spine as well as CSF fluid cytology. Medulloblastomas are staged by the Chang staging system into average-risk and high-risk patients based on the extent of residual disease or presence of metastatic disease (M-positive disease). Though previously classified histologically, the latest WHO classification has incorporated molecular characteristics to stratify medulloblastoma into four subtypes (WNT-activated, SHH-activated TP53-wt, SHH-activated TP53mut, non-SHH/non-WNT (groups 3 and 4)). Adult patients with medulloblastoma are frequently treated according to various pediatric protocols. 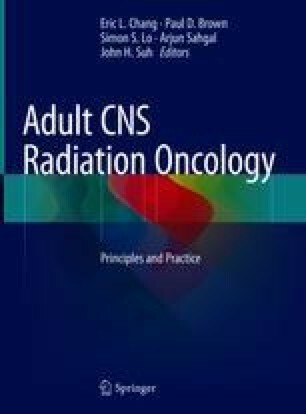 The combination of surgery, craniospinal irradiation, and posterior fossa boost irradiation and chemotherapy in concurrent and adjuvant settings has been shown to be viable in both retrospective and prospective studies. Northcott PA, Korshunov A, Witt H, et al. Medulloblastoma comprises four distinct molecular variants. J Clin Oncol. 2009;28. https://doi.org/10.1200/JCO.2009.27.4324. Moots PL, O’neill A, Londer H, et al. Preradiation chemotherapy for adult high-risk medulloblastoma: a trial of the ECOG-ACRIN Cancer Research Group (E4397). Am J Clin Oncol. 2016. https://doi.org/10.1097/coc.0000000000000326. Bluemke DA, Fishman EK, Scott WW Jr. Skeletal complications of radiation therapy. Radiographics. 1994;14(1):111–21. https://doi.org/10.1148/RADIOGRAPHICS.14.1.8128043.